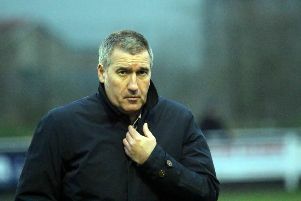 Banbury United boss Mike Ford wants his players to put the Emirates FA Cup exit firmly behind them and refocus. Despite another early exit from the FA Cup – but this time at the hands of a higher ranked team in Bath City – the Puritans have made an excellent start to the campaign. United sit fourth in the Evo-Stik League South table ahead of Saturday’s trip to Kings Lynn who, surprisingly, are languishing near the bottom. But Ford knows his side will face another tough test on Saturday. The United boss wants his players to get back to what they have been doing in the premier division central, which sees them sitting in fourth spot with just one defeat. Ford said: “We have to put the FA Cup tie in the context of the 11 games we’ve played so far. We had two good cup performances against Weymouth but were beaten by a side from a league above and we need to remember that. “What we need to do is focus on ourselves and keep the momentum going because what we’ve got to remember is that we’re fourth in the table. “We need to come into training this week and work hard to get things back on track. We’ve got a tough game coming up at Kings Lynn and we need to be ready for that and we need to be much better than we were against Bath. “We need to dust ourselves down and it will be good to have a clear week to focus on next Saturday’s game. Kings Lynn will probably feel like they’ve underachieved so far so I’m expecting another tough game. They’ve changed the manager and have still got good players.